Happy Valentine’s Day! We hope you have a day full of love. I wish we were celebrating, but unfortunately our entire family is down with the flu AGAIN. Yes, this is the second time in a matter of four weeks. Whatever strains of flu are floating around, they are unkind and not friendly. I’m actually on the mend, but I’ve been nursing high fevers in my two kids for three days while Josh was at a farmer conference at Breitenbush Hot Springs, though the minute he arrived at the retreat, he came down with the flu, so it wan’t fun for him to be there this year. From ear infections to sinus infections to high fevers to stomach flu, the four of us have been sick in some way since early January. Everett attends kindergarten, which is how this all happens—little kids are vectors for illness. Okay, enough of my complaining about flu! I do have to say that Teodora and Gregorio pretty much harvested, washed and packed all 100 boxes for you this week while Josh was gone and I was hanging with kids. I don’t know what we’d do without them. They are amazing! When we finally get better and stronger, we’re going to start moving forward here on the farm. We’ll be putting up the new hoophouse soon (did I say we were going to do that last time?) and next week we plant all the hoophouses with spring crops. We also begin all of our major seeding for the spring as well as start getting the soil ready with all this nice dry weather, so next week is going to be busy. We also start markets up again in a few weeks! Here we go again! This year is going to be a little different as I’m (Melissa) working part-time off the farm as well as going to graduate school part-time to get my MFA in creative writing. Yes, I’m crazy! But, it has been my dream for 10+ years and I’m finally pursuing it and so so excited, but I’m going to be one busy lady. I’m going to withdraw from the farm a little bit so I can stay sane, but I hope to make an appearance here and there at the farmers’ markets at least. And because my book project is about the farm, I definitely need to stay close to the dirt! 1# Beets – I make a grain-free, sugar-free brownie: Almond Flour Brownies. Shredded beets would go great with this. 1 Bag Multi-colored Popcorn – Airpopped with some olive oil splashed on top and tossed with a little sea salt, kelp powder and yeast is the best way to eat this. My kids go crazy over this snack! 1 bu radish (yes!!!! so so so so sweet!) – Josh seeded these red radishes in the aisles of our hoophouses back in October, so they’ve been growing all this time and have just matured. They are so sweet. My son eats them raw in his lunches—that’s how good they are! A really nice experiment that we will definitely do again next year. So nice to have a change in vegetables right now. I’m sure you feel the same. 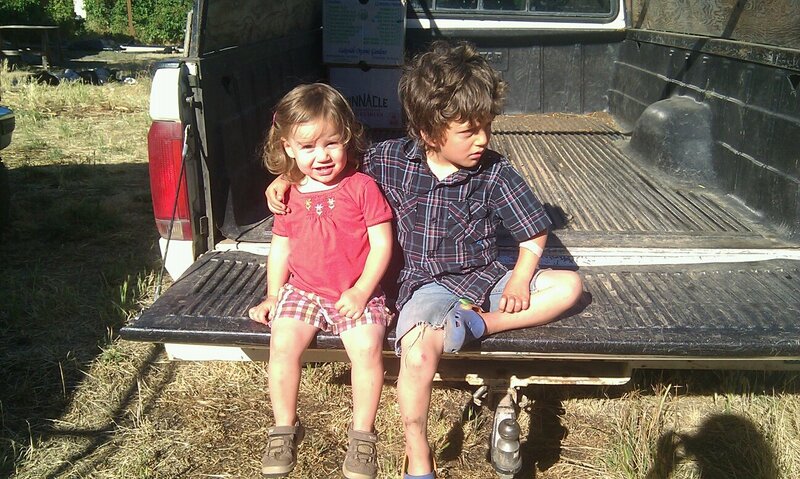 Ava and Everett – farm kids in the Ford truck. A nice reminder of how good summertime is! The Farmer’s Markets are just a few weeks away, so it is time to start thinking about purchasing a Barking Moon 2013 Market Card. * You purchase a credit at the beginning of the farmers’ market season called a “Market Share”. * We have 3 Market Share options. Shares are limited and must be purchased by May 1st to receive season discounts. * Use your Market Share card at any of our farmers’ market booths in the Rogue Valley from March through November. We sell at several farmers’ markets in Ashland and Grants Pass. Why join our Market Share Program? * You save up to 15% on produce at our market booths. 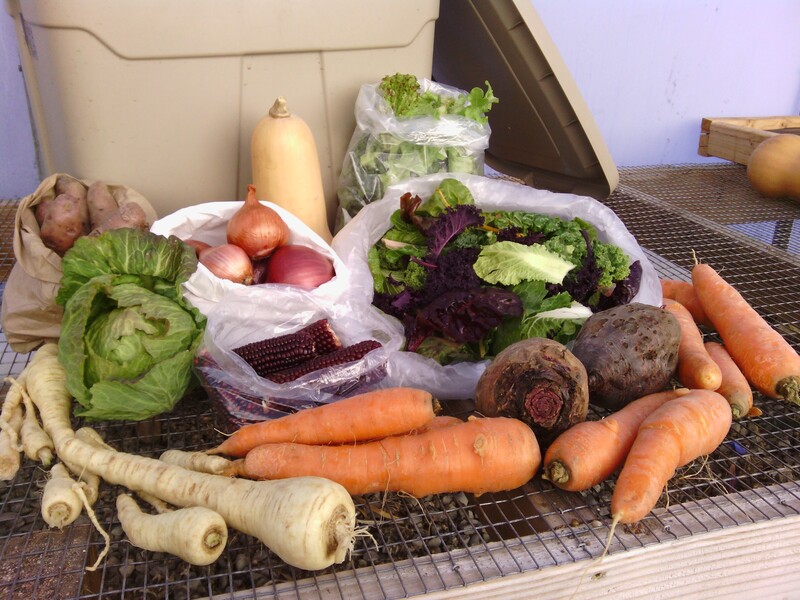 * Unlike a typical CSA share, you get to choose what you want to eat. * Your financial commitment to our farm at the beginning of the farming season is critical to help us fund seed purchases, employees, supplies, equipment, cultivation and planting. 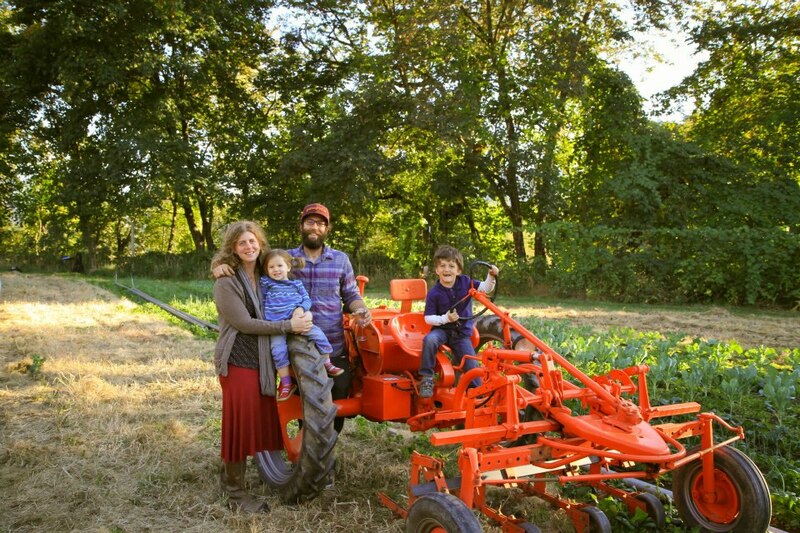 * Together, we create a strong personal connection as the food we grow makes it to your table, strengthening our community through locally-grown organic vegetables. Questions? Call 541-846-6297 or email barkingmoonfarm@gmail.com. Oh my, how time flies! Hard to believe that we have arrived at the fifth box already. Today marks the half-way point between the Winter Solstice and the Spring Equinox. January 31st is typically the day modern pagans celebrate the Gaelic festival, Imbolc, which is held to celebrate this transition into spring. Because I’m a writer, I’m extraordinarily interested in etymology, which is the study and history of words and their origin. Imbolc comes from the Old Irish i mbolg which means “in the belly”. This refers to the pregnancy of ewes or ewe’s milk. In agriculture, ewes and does are bred in the fall and as the snow falls and the weather turns cold, their bellies grow until spring when they birth onto the warm ground. For farmers, spring brings birth, renewal, warmth, growth, celebration—everything we farmers love. I’m happy to say goodbye to January today. January is the hardest month for me personally. While it invites refuge and introspection, I find it becomes too dark and too deep for me. Our plates of food become repetitive—kale, squash, roots and protein. By this time of the year, I’m ready for some new vegetables. How do you spice up your dinner plates during this time of year? Do you celebrate the half-way point between winter and spring? We do. I joy in this transition from winter to spring, especially as the sun comes back for longer stretches of time. I know then that warmth is not far away. And too, in February, the plants start growing again. That’s a reason to celebrate, if anything. We also begin sorting seeds, planting seeds, planning. It is a all a good time. As William C. Bryant has written, “the February sunshine steeps your boughs and tints the buds and swells the leaves within.” Or William Blake, “”In seed time learn, in harvest teach, in winter enjoy.” With that, embrace your February and enjoy your box! P.S. We raised enough money to purchase the hoophouse and plastic! Thank you everyone who contributed. You are all so wonderfully supportive and amazing! P.P.S. Save the Date for our February 17th Winter CSA brunch. This is a special event on our farm just for CSA members. The meal is made entirely of Barking Moon vegetables and local meat. We eat in our greenhouse together while enjoying music and sun (hopefully!). Fulcrum Dining will be catering the event. More details to come. We hope many of you can come. 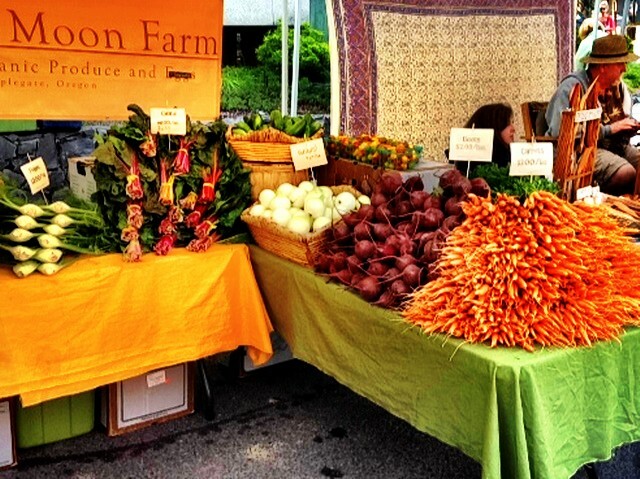 This was taken at last fall’s Farm to Fork event at our satellite farm. We are standing in our winter/fall crops, which you’ve been eating all winter! It has been a quiet two weeks. We’ve had a bit of sickness in our household (actually my son is down with the flu as I write this) and most of our days on the farm have been engaged in an assortment of winter tasks. Our small greenhouse is already full of vegetables for the new season: salad greens, spinach, escarole, frisee, peas, mustard greens, arugula, kale, chard. The exciting news on the greenhouse front is we finally purchased a vacuum seeder! This contraption is going to save us so much time this year. Normally, our crew spends hours and days seeding flats of vegetables throughout the season, but with the new seeder, it happens much faster. We can seed 120 flats in no time. Needless to say, our farm manager, Gregorio, is very happy! Other than greenhouse seeding, we finished putting up our NRCS high tunnel and they came out this week to approve it. This was part of a grant program from the USDA, in which the government paid for the whole house. Pretty nice deal. The burn pile has been a regular activity here in the mornings as well when the thermometer reaches below 20. In the upcoming weeks, we will continue to keep seeding as well as finish all of our 2013 planning (we always run late on this and it always creeps up on us too fast!). The biggest thing for us this year is I’m (Melissa) not going to be working on the farm as much as I did last season. Last season, I ran the pack-out and wash for the markets as well as ran the Grants Pass market for most of the season. But, I just got a new part-time job as the Executive Director of Rogue Advocates, so I’m transitioning out of “physical” farm duties for a bit while I focus on this work. Check out the website for more information about the mission and organization! In other news, we did just put in an order for 50 fruit trees, so we are excited to plant our first orchard! We have chosen italian plums, apples and pears to start. In addition, we have purchased varieties of apples and pears that are October harvested and which can be stored in our cooler for the winter CSA program. Six years from now, we hope our winter CSA will have an abundance of products besides vegetables. We have plans to purchase two does this fall so we can start milking next spring and produce kefir, yogurt, and cheese with our goat milk, and hopefully, have those products for sale for CSA members as well. Diversification and big dreams! We’re also working on a brand new website, hopefully to be launched in the next few weeks? The great Matthew Domingo from Farm to Fork Events is working on it with us and we can’t wait to get it up and running. A long overdue upgrade! I hope you are enjoying the CSA. I scanned the produce departments at the local grocery stores recently and there is very little to no local produce, so I’m happy that at least you all get to supplement your diet with our produce. I know that Josh and I stress out over these boxes hoping that everyone is happy and enjoying what we provide. When I take a look at the produce departments, I know that we are providing a special service. We also want to say THANK YOU to everyone for signing up for a seventh box and participating in our hoophouse revival. Like I said before, WE ARE NOT A FARM WITHOUT YOU! You are truly a participant in community supported agriculture! 4# Carrots — Sweeter than ever with the icy temperatures! 2# Red Onions – I love red onions roasted with butternut squash and cauliflower. Such a good combination! Also, if you make a seed mixture of fenugreek, cumin, yellow mustard, fennel and coriander and toss that with the vegetables before roasting, yummy! Butternut Squash or Blue Ballet Winter Squash – I have to tell you about my breakfast this morning. I’m beginning a special diet—the GAPS diet—to heal my gut and some other inflammatory issues I have in my body, so I can’t eat potatoes and most of my diet consists of meat and vegetables. Anyway, this morning, I melted ghee (you can use butter if you like) and shredded butternut squash (probably two cups) and then made two nests in a pan with ghee (like hash browns). I cracked an egg in each (make a little depression for the egg) and fried the nest, flipping a couple times until the squash was cooked (taste it until it is done) and the egg. Wow! Amazing! I then cooked up some bacon and some savoy cabbage (also cooked in ghee) and ate it all together. I highly recommend this breakfast. I’m going to feel good all morning.One more detail: Butternut squash has a dimple on one end. It is not rotten. It is because we store hundreds of pounds of squash on top of each other and that’s why there is a depression. Grants Pass and Ashland 1 are getting Blue Ballet. Everyone else is getting butternut. 3# Rose Finn Apple Fingerling Potatoes – This is an heirloom variety of potato with outstanding flavor! 1# Braising Mix – We put this in everything—on top of eggs, in stews and as a side dish with dinner. Sweet flavor! 1# Red Popcorn – Again, the instructions for these are the same as the last popcorn round. Take off the cob and pop in coconut oil, or in an air popper. It does well in both. So delicious! This is a variety called Red Beauty and the kernels stay red after popping, so it is pretty popcorn on top of tasty! 1# Beets – We’ve been shredding beets onto our salads and roasting them. They have amazing sweetness! 1# Parsnips – A stew staple. We eat a lot of soup and stew around here, at least a couple times a week. It is a guaranteed meal my kids will eat and nourishing with homemade bone broths. Parsnips go good with any stew! Savoy cabbage – A treat. We didn’t have the best cabbage crop this winter. As you know, our fall brassicas had trouble in the field with pests, etc. and we usually have abundant cabbage crops, but not this year. But, at least we were able to get out there and get a sampling for you all! The cabbage was harvested while frozen so there may be ice in it! I had it this morning and there was no ice. It also has not been washed. Enjoy! 1# Shallots – Great pizza toppers! In my search for recipes for your box, I came across this Pininterest site all about winter CSA Recipes: Real Food Farms. A great resource. We’ve spent most of the last two weeks celebrating the holidays, resting, sledding, eating and spending time together as a family. Now that the calendar has flipped over to a new year, we have to get into gear for this next season. It always creeps up on us so fast. This week, we start the first of all the greens that will get planted in a few weeks in the hoophouses. We will continue to do other maintenance around the farm and plan for this next season. And enjoy the quiet of winter! 1 Bundle Painted Mountain Flour Corn – Yes, this IS food! And easy to process! Just take off the cob with your fingers and grind in a blender, coffee grinder, food mill until you get a flour. You can make delicious cornbread, polenta and corn muffins with the grain. It has a sweet and delicious flavor and when ground gives the flour a purple color. This is my favorite corn muffin recipe: Gluten Free Corn Muffins. My kids devour them. They are so so good made with this corn. Check the recipe page below for more ideas. 1/4# Red Cayenne Peppers – We thought we’d try these out this year as another added bonus for the winter CSA boxes. Let us know what you think. These are hot, hot, hot, hot! They can go straight into a hot chile sauce, added to salsa or chili, or hung as a decoration. Many people think a hanging ristra brings a home good luck. Here’s a link on how to hang the chiles as well as a recipe for chile sauce: Using Chile. This one looks good—a fermented hot sauce: Homegrown Cayenne Pepper Hot Sauce. 1 Rutabaga – Also called a Swede Turnip. They are botanically different: turnips are members of the mustard family and have been around since ancient times; rutabagas originated in the 1700s in Scandinavia. Turnips have a higher water content than a rutabaga. Rutabagas are often peeled, turnips don’t really need to be but can. We absolutely love rutabaga! 1/2# Salad Mix – Our spinner was frozen yesterday, so some of the mix was spun by hand. Some of the bags may be wetter than others. Check your bags! 4# Russet Potatoes – On some of the potatoes, there is a strange open core in the middle. It isn’t rotten. Just cut around it. Still edible! Winter has come. I write this as the snow falls on the farm and the fire burns warm in our kitchen. We love this time of year especially as we approach the winter solstice. But, there is never a dull moment on this farm, I tell ya! You think things are moving along well and fine and then bam, disaster! The power of Nature humbles me in moments like these. Last night, the wind blew hard and didn’t stop for hours. Josh and I did not sleep a wink—we tossed and turned just hoping that our three hoophouses would remain standing, though we knew there was a very good possibility that one would go down. A couple of weeks ago, the wind pulled a few of the metal hoops out of the ground on one of our hoophouses, so it was already on its way out. Last night’s wind was mighty and forceful, so we had a feeling we’d wake up to see the whole thing flipped over. And we were right! We’re definitely feeling down about it as the initial assessment tells us that only a few of the hoops are salvageable and the plastic cannot be used for another hoophouse. Plus, the house smashed beautiful mustard greens and arugula! So sad. But, these sorts of things happen on a farm and with more experience, we are able to weather such challenges. It is all part of the adventure of farming! Our employee did drive up this morning and come to our door and say, “Lo siento, patrona. F@#$ing wind!” Thanks Gregorio! That made me smile. Anyway, we do want to wish you a beautiful, magical and happy holiday season, Solstice, winter and New Year as you celebrate with your family and friends. I know in the wake of current events this past week, our hearts have been heavy with sadness and empathy for the families in Connecticut. As a mother of an almost six-year-old, I can’t imagine the pain and grief the families are experiencing. In light of this, we send you love and warmth to you during your winter festivities. Stay warm and enjoy good eating! 1# Celeriac (also known as Celery Root): So delicious. Great for soup with potatoes. Check out recipes in the PDF document below. 1 Bu Arugula – Just toss with olive oil, salt & pepper and serve! Basha, our new English Shepherd pup! Ruined hoophouse by the wind. Gregorio washing veggies in the snow! Arugula for the CSA. This is the now ruined hoophouse yesterday before the storm. The new hoophouse going up. Every year we approach the first winter CSA pack and harvest with a mixture of trepidation and excitement. Running the winter CSA is our favorite thing to do on the farm. As our niche, we can really customize the program and be creative in putting together a box of food that is delicious and nourishing. While we can plan, predict, estimate and map the CSA program every year, nature is unpredictable and often times, circumstances beyond our control arise—freezing temperatures, broken equipment, crop failures. If you look at the history of our winter CSA on the blog, you’ll find that we have faced various challenges over the years. As we go into our fourth year of providing food to families during the winter, I think we are getting better at it, and becoming better equipped with tools and experience to surmount any challenges we face. Anyway, today we deliver over 2,000 lbs – that’s 1 ton – of fresh produce to 94 families in the Rogue Valley. We think that is quite an accomplishment. The delivery truck is packed from top to bottom and as Josh makes the rounds today and drops off all this food, I know he is driving around with a big smile on his face and a feeling of fulfillment, satisfaction and joy knowing that all of the families who subscribe to the CSA will be eating delicious and nourishing, organic vegetables for the next two weeks. It makes him happy. Plus, he’s got our two-year-old daughter with him today and that makes him even more happy – to share this experience with his children! This week is a big week for us — a new hoophouse will be delivered by OBC today, the cost of which is covered by an NRCS program out of the Farm Bill, cooler expansion is underway AND best of all, we drive to Antelope, Oregon tomorrow to pick up our new farm dog! We are bringing home an 8-week old English Shepherd pup. We are so excited to have a new dog after losing our dog in September of this year. And the English Shepherd breed has been bred to be a part of a small, diversified farm as a helper and working dog. Since our farm dog passed in September, the animals have been creeping in on the farm – turkeys, squirrels, deer. And while we love wild animals, they also break into the greenhouses and hoophouses and threaten our tender greens, so we need a dog who can let them know the farm boundaries. So, expansion, building and puppy training are all in the plans for the next two weeks. Lots to do! Enjoy the produce this week and please let us know if you have any questions, concerns or happy stories around food you want to share. We love that kind of stuff! 4# Yellow Potatoes – We had an amazing potato yield and harvest this year. The potatoes are big and beautiful. Enjoy! (This has to do with the fact that we grew the potatoes in new soil – potatoes love that!). Saturday is the first day of Hanukkah – I’ve included a recipe for Potato Latkes! See below. 1# Braising Mix – Yum! We’ve been eating this all week. A mixture of kales and collards. I have it on top of everything! 1 Bag of Tom Thumb’s Popcorn — Okay, this is so easy to deal with! I promise. Just take it off the cob with your fingers (a good job for kids!) and pop it up in a pan. I’ve been experimenting a lot with how to get the best pop out of this popcorn. I highly recommend generous amounts of coconut oil as your fat to pop in. I sometimes add a little olive oil with the coconut oil, but because coconut oil is a stable fat/oil and because it is so good for you, I pop our corn in that. Make sure you let the corn start to pop before you shake the pan. The kernels are smaller than what you are used to, but the flavor is outrageous! You can also try it in an air popper. This is an heirloom variety of popcorn and you should be able to get a few batches out of what we’ve given you today. One of three hoophouses full of winter greens. Chard harvest for the CSA boxes.